The Communication Skills and General Knowledge domain of the Early Development Instrument (EDI)** includes skills to communicate needs and wants in socially appropriate ways, symbolic use of language, storytelling, and age-appropriate knowledge about the life and world around them. Almost half of all children in Manitoba (49.4%) who are vulnerable in at least one area of the EDI are vulnerable in communications skills and general knowledge. 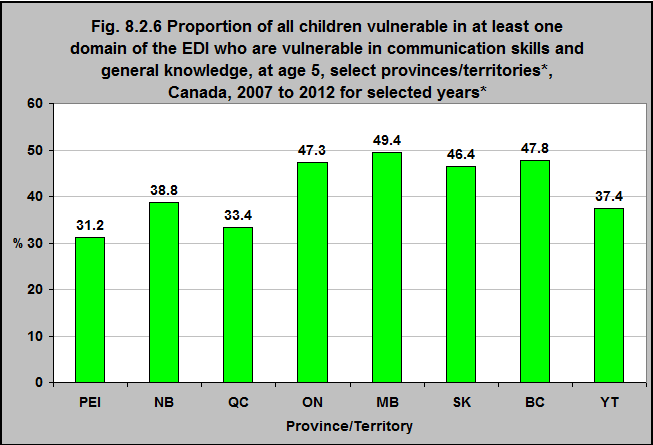 Less than one third (31.2%) of the children in PEI who are vulnerable in at least one area of the EDI are vulnerable in communications skills and general knowledge.